And to think we are only starting the 3 month of the year. My next goal is to get closer to being able to do a free-standing handstand. This type of body movement can’t be accomplished with just brute strength. It takes balance and concentration. Obviously, the bigger and taller you are the more difficult this will be for you. When I was younger that is the way we would try. Head as close to the wall as possible, elbows bent, then quickly whip your legs up as quick and violently as possible. Well there’s issues with this method. First your arms are bent so they aren’t bearing much weight. Even if you extend your arms and whip up your legs. Your arms are in front of your body and you won’t be able to maintain a handstand in that form. Second if you are just starting out you likely don’t have the core strength to control your legs whipping up so fast. 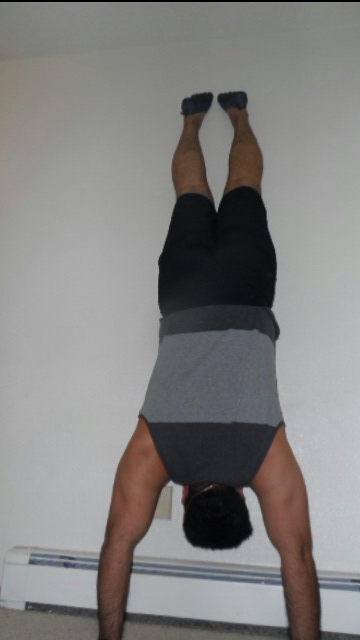 Do you want to join me in this hand stand challenge? Comment with your handle/name, Social Media used , and “DONE” when you are complete.